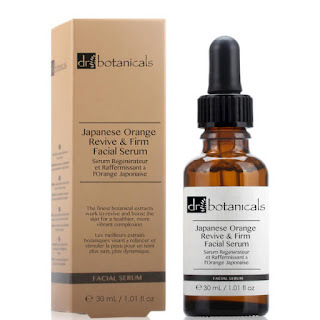 Today's post is going to be fairly short as it's a simply review of Japanese Orange Revive and Firm Facial Serum. This product is a facial serum made of a blend of the finest botanical extracts to revive and boost the skin, whilst counteracting visible skin damage caused by environmental stresses. It's aim is to improve skin health and appearance while reducing visible signs of ageing for a younger look. Sea Buckthorn Fruit Oil: rich in Vitamins A, C and E and essential fatty acids, which work to nourish and hydrate the skin, leaving it protected and enriched. Rose Otto Oil: contains high levels of Vitamins A and C, which aim to rejuvenate the skin, even skin tone and reduce visible signs of ageing. Initially, I wasn't going to buy the product because I didn't think I fit into the catergories for whom the product is aimed at. I wasn't particularly worried about damaged skin, ageing or skin firmness. However, after speaking to an independent skin expert, I was told it's never too early to start fighting signs of ageing and damage skin include skin acne and scarring. Well, I was sold! I love that Dr Botanicals as a company is vegan certified and all their products are made only of natural ingredients. The range is based 100% in natural ingredients, all paraben and harmful preservative free. They have also never been tested on animals. I started the serum in the evening after cleansing and applying my acne treatment product. Like I said, I wasn't initially expecting to see all that much but I was trying it anyway. I absolutely adored the smell. I think the orange is really strong which is great for me because I love citrus scents. If you don't, this probably isn't the product for you. I persevered through the process for a week. I actually hated applying it. I dispersed a few drops every evening into my fingers and then patted it on my skin. I hated how it left my face sticky; it wasn't oily but it didn't really absorb well and it just felt sticky. Nevertheless, after a week, I defintely thought my face felt thoroughly hydrated and nourished. Surprisingly for me, I felt more radiant and my skin glowed more. Unfortunately, I didn't how faffy it was to add an extra step into my routine and the results didn't make up for the application so I stopped. Instead, I gave the product to my mother who is much more of the target audience in my opinion. She checked yes next to each of the bullet points listed above. After 4 weeks, her results were as follows. She really enjoyed the smell as well and thought it smelt 'lovely and feels luxurious when applying'. Initially, she began applying it before her moisturiser but then she decided to mix in into her moisturiser. She agreed, it was 'not pleasant to apply' alone but when adding '3 drops into moisturiser on cleansed face morning and night' it felt amazing. In terms of results, for the first 2 weeks she was raving about it. She really noticed that the lines above her lips were smoother and appeared to have reduced so she defintely felt she had visible signs of reduced ageing. Sadly, the results did not continue. They very much plateaued. Overall, her face looked and felt softer and looked "a little more radiant, less dull", but the reason she would use this product would be for the anti-ageing like benefits and that area did not match expectations. In summary, I liked the packaging and delivery system. I loved the scent but wasn't happy with the way the serum applied and both myself and my mother were disappointed with the results. I think it is great for a moisturiser as it does make your skin softer and the product lasts for a very long time. After over a month of solid use (starting with 2 people), there is still half a bottle left. Personally, for such an expensive 30ml bottle, I was expecting it to not only work well but to feel amazing. I would not repurchase this product and I do not think it worked well enough for the retail price. I have however found it for a cheaper price at both Amazon and Look Fantastic which might be worth considering if you feel like this serum will meet your needs. To get £5.99 off your next Dr Botanicals purchase you can use the voucher code YBP151292 (limited availability). Wow this is so informative. Will for sure check it out! I am so glad you thought it was! The use of serums in my nighttime routine is something I’m quite new to. This is an informative post. Thanks for sharing!